We remind you that the 2nd round of the competition "Race For Profit" is on. 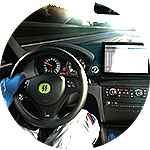 Hurry up to become the best racer FreshForex till November 29. Only 11 participants overcame the level of gain 10%, so you have a chance to enter the top 20. Also, a leader reached 180% of the the indicator "Gain" — show what you are able to! - close at least 10 deals. We have doubled the prizes — there are two times more chances to win. Take part in the contest right now, switch on your maximum acceleration and set your own record! The full terms of participation can be found on the page of the contest. More profit with “Sale of spreads”! We present bonuses to the subscribers of ForEXpress! Choose FreshForex and receive bonus! Hit parade of the most popular FreshForex promotions!